Where there was grass, now there was ice. We had officially reached South Georgia. Though we had traveled mostly east during our 950-mile journey from the Falkland Islands to South Georgia, the temperature was cooler, the mountains were taller, and the horizon was dotted with clouds, snow, and glaciers. Even though South Georgia is only slightly further south than South America and the Falkland Islands, the 103-mile range that makes up South Georgia Island is viewed as the last reasonable outpost before reaching the Antarctic wilderness. In today’s post, we’re sharing some of South Georgia’s fascinating history and a look at the wildlife and landing sites you can experience on the island! South Georgia Island’s earliest recorded history suggests exactly how harsh this remote island can be. A full 81 years elapsed between the island’s first recorded sighting by British merchant Antoine de la Roché in 1675 and its second by the Spanish vessel Léon in 1756. 19 years later, in 1775, famed British explorer Captain James Cook would record South Georgia’s first landing in Possession Bay. Thinking he had finally found the long-rumored “southern continent” (referring to Antarctica), Captain Cook was soon disappointed when he rounded South Georgia Island’s southern cape and was once again facing West, meaning he had simply found a modest island – today the Sandwich Islands. To honor (dishonor?) this dubious journey, Captain Cook named this bend Cape Disappointment. Captain Cook would recover his disappointment and immediately claim South Georgia as a sovereign subject of England and King George III (for whom the island is named). This political designation would remain remarkably stable and continues to this day. Currently, South Georgia Island is a popular breeding ground for different marine mammal and seabird species due to the nutrient-rich waters that surround the island. These waters are abundant with food for South Georgia’s supported species thanks to the confluence of ocean currents from the Atlantic and Southern oceans that deposit rich nutrients in South Georgia’s waters. While South Georgia’s recent history is highlighted by the immense amount of wildlife that call the island home, it is perhaps one man – and not the animals – that cultivated South Georgia’s most incredible story. On the eve of our landing in South Georgia, we learned about the famous exploits of some of the early Antarctic pioneers. Perhaps the most memorable and touching was that of Sir Ernest Shackleton and his ill-fated expedition, The Endurance. Sir Ernest Shackleton was an Irish-born British explorer who spent most of his career fixated on the Antarctic. After seeing his original goal – discovering the South Pole – reached first by two other explorers, Shackleton created a new goal: make the first land-based crossing of the Antarctic continent. Shackleton was perhaps not a natural-born marketer… yet he was simply legendary in his leadership capabilities. Despite his work notice that famously warned “Low wages. Bitter cold. Safe return doubtful.”, over 5,000 men applied for a position on Shackleton’s crew. Ultimately, just 28 men were selected to sail on the Endurance when she reached South Georgia Island in November 1914. Shortly after setting sail from South Georgia in December 1914, the Endurance was trapped by unseasonably thick ice. Willing to wait until thawing ice set the ship free, Shackleton and his crew were dismayed when the melting ice floes first splintered and then destroyed the Endurance. With little more than the ship’s three lifeboats, the crew set sail north. Realizing his dreams of a trans-Antarctic crossing were crushed along with the Endurance, Shackleton set his most important goal yet – ensuring his entire crew survived. Upon reaching Elephant Island, an uninhabited outpost of the South Shetland Islands, Shackleton faced his ordeal’s most crucial question: head against current north to the closer Falkland Islands, or head with the current and set sail – in a 23-foot lifeboat – for South Georgia Island, some 800 miles away? Along with his five best men, Shackleton set course for South Georgia. He fully realized that should he fail to reach the island, Shackleton was condemning the 22 men he left behind to certain death. With limited water and one biscuit per day for food – which, according to one sailor’s diary, the seamen “looked at for breakfast, sucked for lunch, and ate for dinner” – the meager lifeboat James Caird reached South Georgia after 16 grueling days at sea. Unluckily, Shackleton’s saga wasn’t finished. Having landed on the southern coast of South Georgia Island, Shackleton needed to reach civilization on South Georgia’s northern coast to rescue himself and his remaining crew on Elephant Island. With no other choice, Shackleton set off with Frank Worsley and Tom Crean to traverse South Georgia by land – a punishing passage that, besides having never been charted, was riddled with peaks, crevasses, and unforgiving winds. Undeterred, Shackleton and his men made the passage – numbering over 30 miles – in just 36 hours. The next day, a whaling ship rescued the three men Shackleton left behind on South Georgia’s southern coast. And, 3 months later (due to poor weather conditions), Shackleton, Worsley, and Crean boarded the Chilean navy vessel Yelcho and set course for the South Shetland Islands. Once Elephant Island was in sight, Shackleton eagerly stood upright, counting the figures he could see on shore. After re-checking his count, he turned to Crean and told him the great news. Every last member of the Endurance had survived. His fellow crew mates were standing and cheering not only their rescue, but also the indomitable spirit and will of their leader. Shackleton had achieved the most important goal he set. Aside from his daring bravery, what struck me most about Sir Ernest Shackleton was his obsession with uplifting the human spirit in desperate times. Knowing the threats that hunger, thirst, and boredom presented his men, Shackleton remained fearlessly innovative in keeping his crew entertained. Whether it was simple games like football or more outrageous maneuvers like shaving everyone’s head or having officers ballroom dance for the crew, Shackleton knew exactly which tool was necessary to craft a crew whose spirit and optimism persisted. We highly recommend watching this Shackleton documentary. It’s not too long, gripping to hear and is narrated by Kevin Spacey! Or, if you prefer books, Alfred Lansing wrote this best seller of Shackleton’s incredible voyage. It’s free with an Amazon Audible trial! 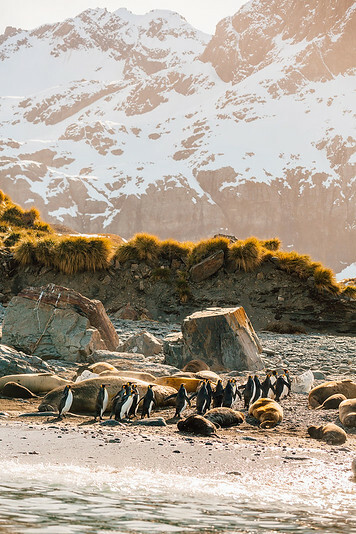 If you love not only wildlife, but a bit of history, South Georgia and the South Sandwich Islands are the place to visit. As one of the first gateways to Antarctica, South Georgia Island was the center of the world’s southern ocean whaling industry from 1904 to 1966. 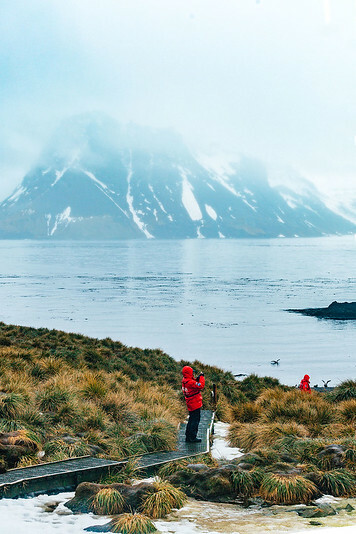 Today, you can visit not only the abandoned remains of these whaling stations, but also beautiful fjords and stark glaciers which abundant penguins and seals have claimed as their own. On our cruise with Poseidon Expeditions, we had the opportunity to visit 8 landing sites. Almost all of these are located on South Georgia’s northeastern coast, as the high mountains dotting South Georgia protect the north coast from the strong prevailing westerly waves. New York. London. Hong Kong. These are the names that typically recur when I think of cities with incredibly prosperous businesses. 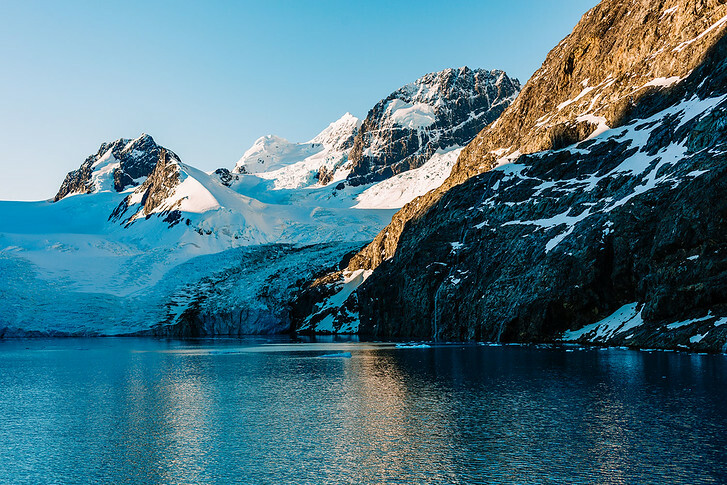 Norwegians and linguists may already have an inkling as to what brought Grytviken – or “Cauldron Cove” in Norwegian – over $100 million annually in today’s dollars. Yes, before there was drilling for petroleum oil, there was whaling for blubber oil. Melted in giant vats (or cauldrons), whale oil was used to produce everything from gas lamp heat to margarine. Entire communities were developed to capture, skin, and flense whales, and Grytviken, established in 1904 by Norwegian settlers, was the first such community on South Georgia Island. Whaling was the beginning, middle, and end of Grytviken’s story. So, when a wave of political, cultural, and economic factors crashed whaling’s viability in the mid-20th century, Grytviken became obsolete and was abruptly abandoned in 1966. 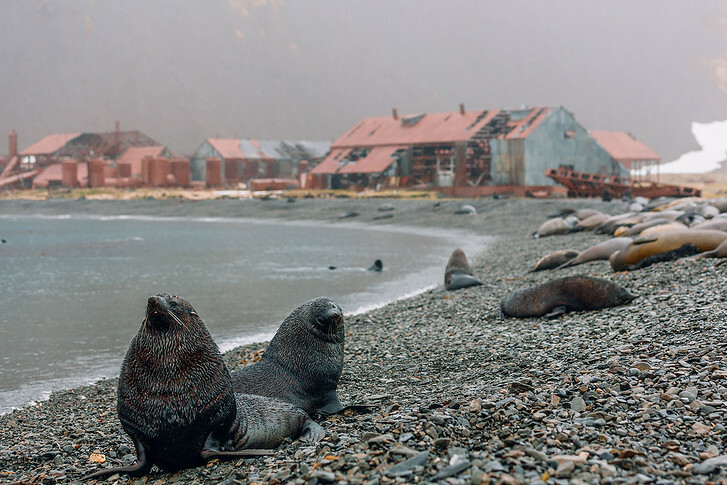 Today, several shipwrecks and the rust-covered whale processing plant make Grytviken something of a mysterious industrial ghost town – with several dozen king penguins, fur seals, and elephant seals added for good measure. 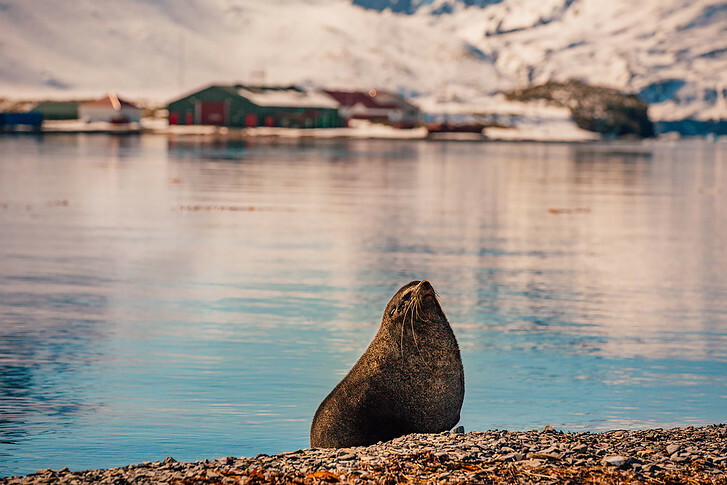 After our Zodiacs landed on the eastern side of Grytviken, we had to navigate two fur seals and a giant elephant seal to reach the Grytviken cemetery. 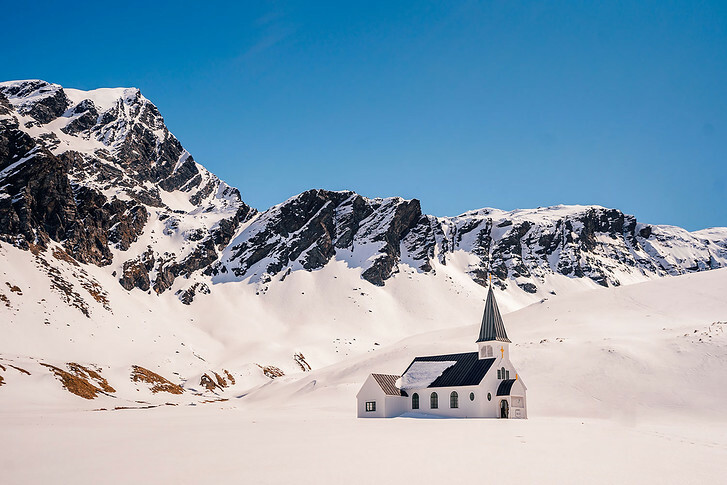 Well-preserved, the cemetery lies roughly 200 feet up the mountainside and houses the final resting places of Sir Ernest Shackleton and 62 others, most of whom were Norwegians intimately connected to Grytviken’s whaling days. After leaving the cemetery and walking just a few minutes along the bay, we found ourselves in the erstwhile Grytviken city center. 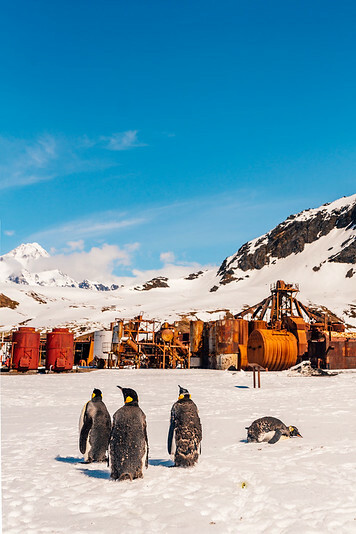 Filled with rusted-over barrels, cranes, and some badly bruised shipwrecks, Grytviken serves as an eerie reminder that humans, too, face a bitter circle of life. Profit from an industry that fails to innovate, and you may be left behind as well. Just a few steps further lay the South Georgia Museum, our last stop in Grytviken. 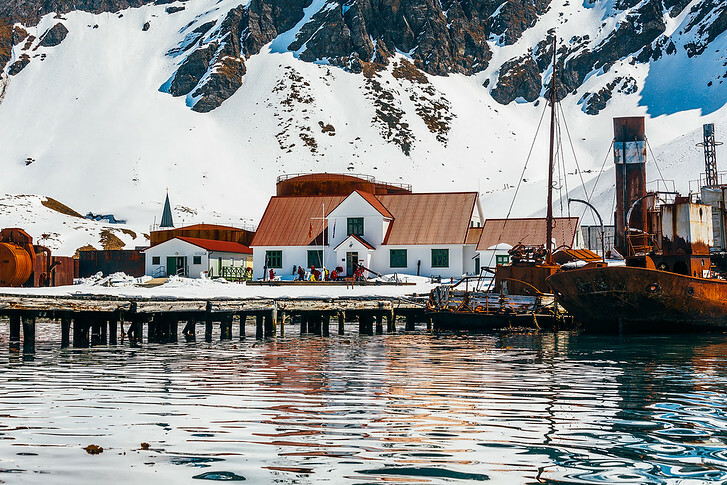 Filled with interesting memorabilia from Grytviken’s whaling history along with a full-size replica of the James Caird, Shackleton’s famous lifeboat, the museum brings some present-day context to a historically rich city. The museum also houses an adorable gift shop that includes homemade knit penguin booties, stunning Penguin ceramics, and even bottles of “Shackleton” single malt Scotch whisky! After leaving Grytviken, the focus of our landings pivoted toward the immense amount of wildlife that South Georgia Island supports. Our next landing at Jason Harbor, just northwest of Grytviken, did not disappointment. 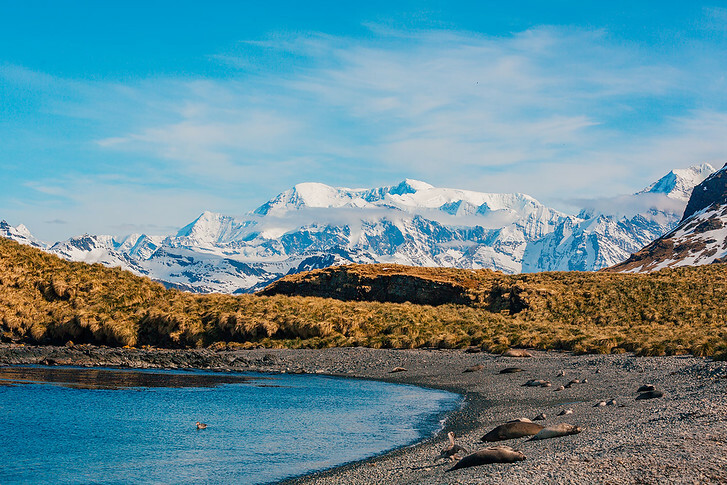 As soon as our Zodiacs reached shore, we were met by hundreds of elephant and fur seals lying on the beach. While fur seals are the smaller of the two species, they are known to be aggressive. Don’t be fooled by their wide, heart-melting eyes – the beach is theirs, and, if you get too close, they will let you know! 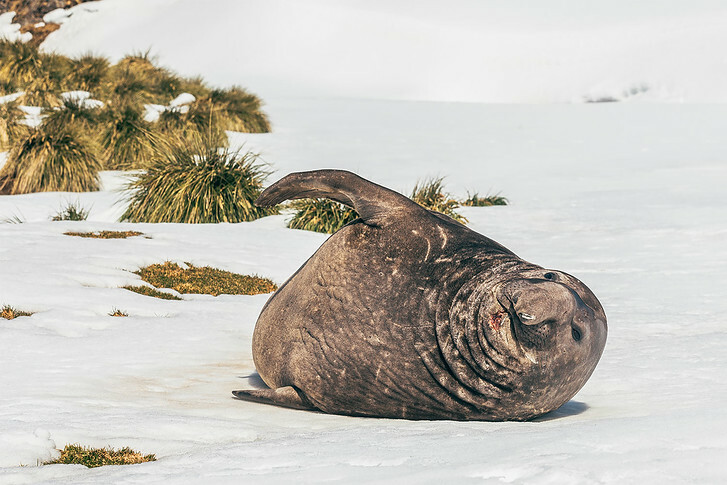 On the other hand, the southern elephant seals are more approachable, seeming quite content to allow humans reasonably close – as long their napping remains uninterrupted! Measuring up to 19 feet long and 9,000 pounds heavy (that’s over 4 tons, folks), the southern elephant seals are the world’s largest pinnipeds. Sadly, males – who apparently lead very stressful waking lives – only live 6-10 years on average. When elephant seals return to South Georgia’s beaches for mating season, each beach has a “beach master” who maintains a harem of mates routinely numbering 40 or more. To establish the dominance necessary to earn the beach master title, the most ambitious males will often engage in prolonged, vicious fighting. Consequently, you will almost certainly see – as we did – seals with bodies scarred, bloodied, and mangled from their jousting efforts. 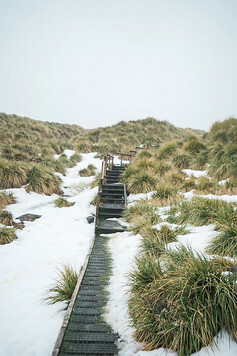 After making our way through the beach, we navigated a maze of tussock grass and small streams that led to a small, snow-encrusted hill. From the hilltop, we viewed a glistening lagoon, the hundreds of seals, and the Sea Spirit sitting calmly in the distance. As the daylight waned we counted our lucky stars, realizing that our incredible South Georgia Island journey had only begun. 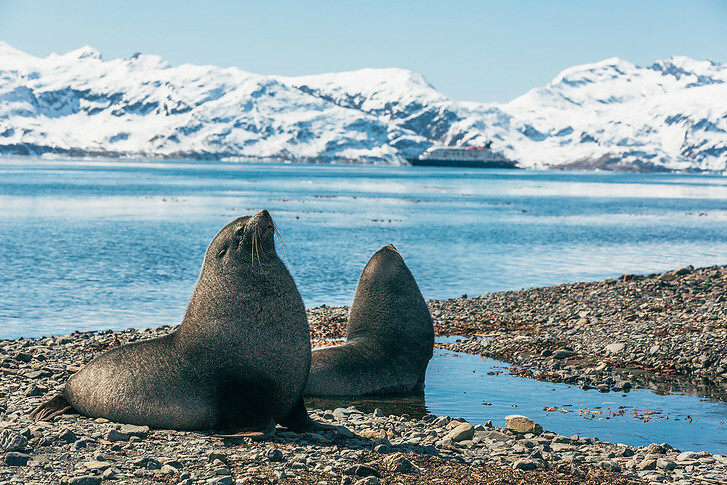 When 6,000 elephant and fur seals are an afterthought, you know you’re spoiled with wildlife to observe. Our second day of South Georgia landings began in St. Andrew’s Bay, located slightly southeast of Grytviken and Jason Harbor. Poseidon Expeditions recommends keeping a 5 meter distance from all wildlife. This not only benefits the wildlife, which stays relatively uninterrupted, but also the observer, who both remains safe and observes the wildlife as naturally as possible. Upon landing at St. Andrew’s Bay, our Expedition team sheepishly told us that, even though they had marked a route that would maximize safety, maintaining the 5-meter distance might be difficult! 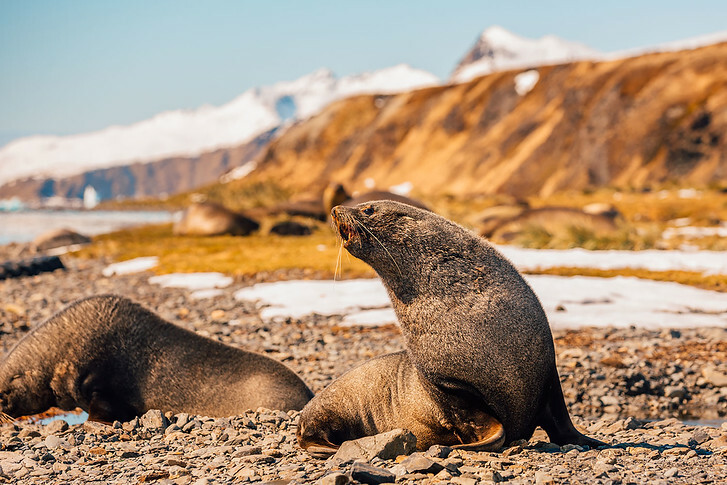 The easy walk along the bay was filled with intermittent stops to observe the thousands of elephant seals, fur seals, and King penguins lying just steps away! While the penguins mostly stuck to their adorable waddling, the seals demonstrated a range of interesting – and graphic – behaviors including jousting, nursing, and – you guessed it – mating! After the hilly topography of Jason Harbor, the mostly flat walk along Saint Andrew’s Bay was welcome. Plus, the only real hill along the entire walk was completely worth summiting. Lying just over a small hill was an estimated rookery of 300,000 to 400,000 king penguins – the largest king penguin colony on planet Earth. 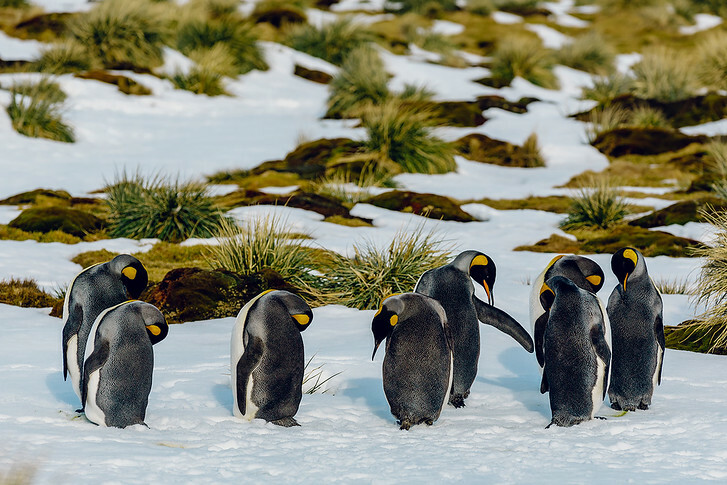 Though we had to remain at a respectful distance given the number of newborn penguin chicks, it was breathtaking – even from afar – to observe so many king penguins in their natural habitat! Not all landings go according to plan. When surveying the remote, harsh, and unpredictable conditions of the Antarctic, aborted landings should occasionally be expected. What was unexpected, however, was aborting our landing at Gold Harbor on a sunny, calm, and downright balmy Monday afternoon. The Gold Harbor beach housed a veritable blockade of fur and elephant seals. Forget the 5-meter rule. We couldn’t have blazed a trail more than 5 inches from the nearest seal! 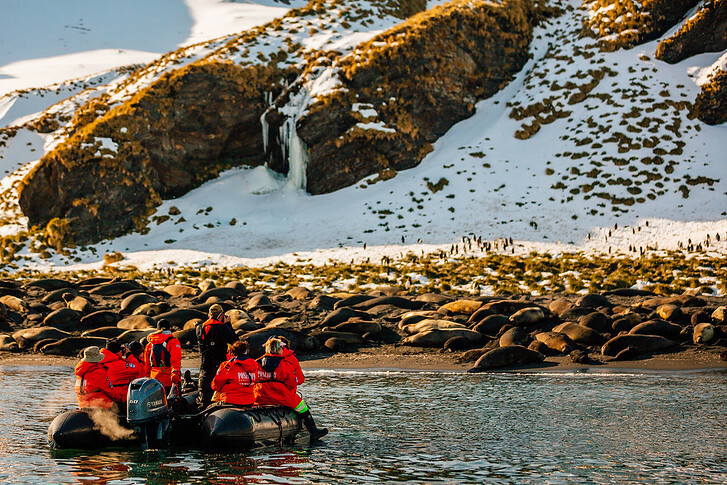 Our initial disappointment quickly gave way to excitement, as our resourceful Expedition Team thought quickly on their feet and arranged a Gold Harbor photo tour by Zodiac boat. C and I got particularly lucky as Ryan, the Expedition Team Leader of the Sea Spirit, was our Zodiac guide. His approachable personality, extensive wildlife knowledge, and experience combined for a super tour. We began by slowly combing the beach, getting close-up looks at the elephant and fur seals who were either resting, tossing rocks on their back to remain cool, or fighting for title of beach master. Interspersed among the giant seals were tiny groups of Gentoo penguins. This smaller penguin species looked more adorable than normal, particularly set against a backdrop of the enormous, loafing seals. After finishing our beach crawl, we came around the outside and navigated a jagged array of rocks, coves, and inlets. Here, we saw some of the incredible bird life for which South Georgia is known – including petrels, skuas, falcons, albatrosses, finches, ovenbirds, pipits, and terns. 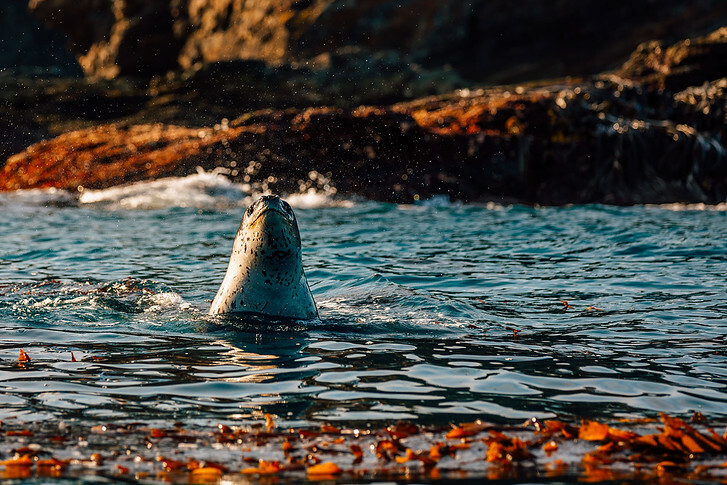 Where we were particularly lucky, though, was right at journey’s end, when several leopard seals – which, as more water-bound than their elephant and fur cousins, are rarer sights – became curious and poked their heads above the water. Knowing that we would’ve never seen the leopard seals had we actually landed, we couldn’t believe our luck. Even when we seemed unlucky, things kept breaking right for us on this incredible expedition! Speaking of luck, we knew the weather had already spoiled us plenty. 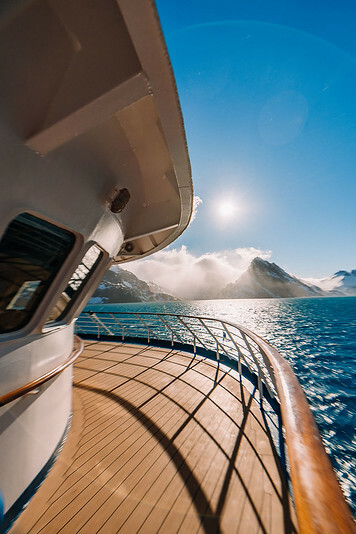 Through our first 9 days at sea, the only clouds we saw were bright white and set against crystal blue skies. The sun was shining, the seas were steady, and the weather was warm. In other words, the weather was highly unusual – even for the notoriously unpredictable Antarctic. So, when C and I awoke to grey skies and steady rainfall on the last Tuesday in October, we could only offer wry smiles. We knew we’d already enjoyed plenty of luck, and we were excited to make the most of facing the elements. It was with a lot of luck and planning from Poseidon Expeditions that we were able to visit Prion Island! South Georgia has designated the 1.5 mile island as a Specially Protected Area, due to its rat free status and breeding albatrosses. Access is permitted only by designated permit and only expedition ships with a Category 1 permit from IAATO are allowed to apply for the visit application. Further complicating matters, only 2 ships are allowed to visit per day and only 50 people can come ashore at any time. 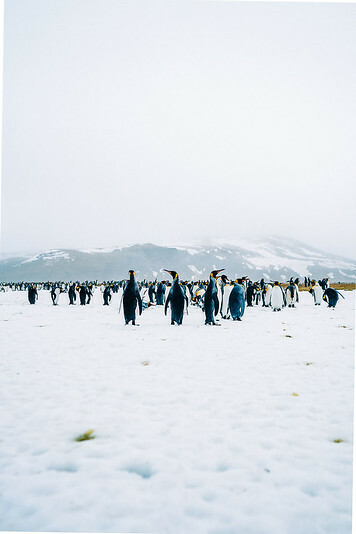 What’s more, the island is completely closed off to visitors from November 20th to January 7th each year (essentially 90% of the Antarctic season) in order to let the local wildlife find partners and breed without human disturbance. The first thing I noticed about Prion Island as our Zodiac navigated the beach side swells was the unique topography. Almost like something from a video game or fantasy novel, Prion Island is a series of flat, mostly round meadows scattered at different elevations. Fortunately, a network of staircases and board walks crisscrossed the paths, making it much easier to see the amount of wildlife that call Prion Island home. And speaking of wildlife, boy, was there plenty to see! 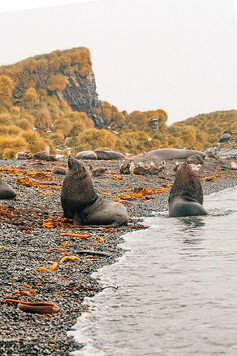 Like many South Georgia Island landing sites, the Prion Island beach was full of elephant and fur seals. We soon discovered that seals, like humans, are particularly irritable during the rain. Regarding Antarctic wildlife, we had already learned that seals, who easily become aggressive, command the 5-meter rule’s strictest adherence. 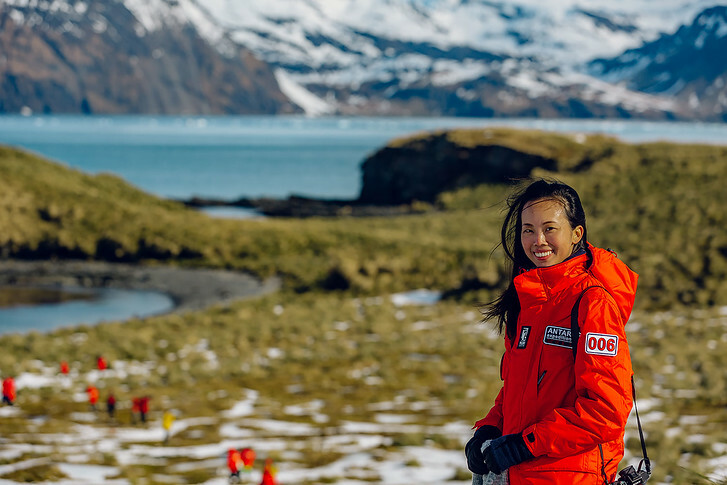 However, our trusty Expedition Team – who have many years’ experience studying and interacting with wildlife – fearlessly shepherded us to Prion Island’s peak. This landing in particular, was for the birders. 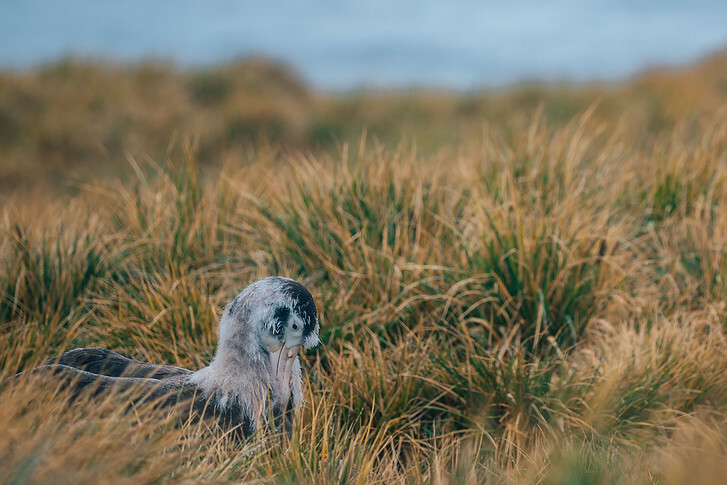 Prion Island is one of the few nesting colonies for Wandering Albatross. These regal sea birds have the distinction of the largest wingspan in the world – over 10 feet! Compare that to the South Georgia Island Pipit, whose wingspan is just 9 inches. Wandering Albatross birds typically soar on the open ocean for hours at a time, riding the updrafts from boat swells. Unfortunately, the species survival is in danger from long line fishing gear. While the Wandering Albatrosses are Prion’s star attraction (we even managed to see some chicks!) other seabirds on site include Flying Albatrosses, Wilson´s storm petrels, South Georgia shags, kelp gulls and Antarctic terns. With our first rainy landing under our belt, we were especially excited for the customary hot towel and hot tea offered once back on board – and to find out what was next! After lunch and a short nap, we had just heaved anchor and were briskly making our way southeast across the Bay of Isles. Just a few minutes later, our next landing site was distantly visible through the fog, waves, and intensifying rainfall. Sandwiched by the receding Grace and Lucas glaciers, Salisbury Plain represents South Georgia’s largest expanse of level ground. The good news? An easy walk. The not-so-good news? No shelter from rain. We were so mesmerized by the sheer amount of wildlife, however, that we barely noticed how wet we were getting. 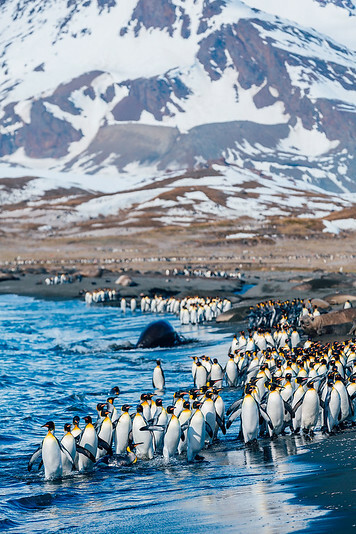 As far as the eye could see, seals and penguins – both adults and pups – dotted the landscape during the entire 45-minute stroll across the plain. A few days earlier, just before reaching South Georgia Island, our Expedition Leader Ryan jokingly warned that we would be sick of seals and penguins by the time we left. 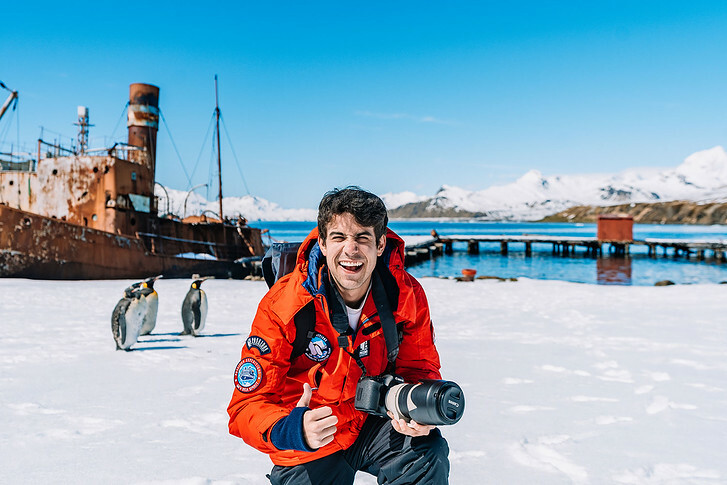 Even though the essence of his statement – that we would see seals and penguins everywhere we turned in South Georgia – was correct, we (as Antarctic neophytes) always seemed to find something unique each time we stepped among the wildlife. Salisbury Plain was no exception. Over 100,000 pairs of King penguins nest at Salisbury Plain from December to February. 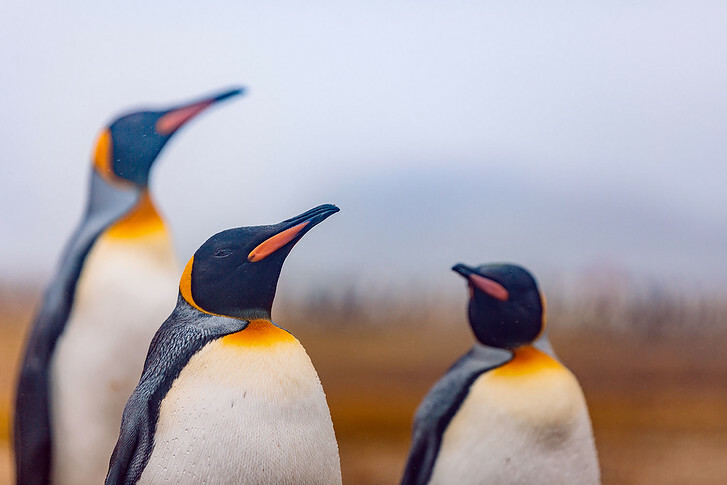 Their story is a unique one, as King penguins are one of the few species thriving. At the end of the 19th century, over hunting had dramatically impacted their global population to just 350 pairs in 1912. Thankfully today, they’ve recovered! Back on Carcass Island, we had seen a few bones scattered here and there. They were small, unidentifiable, and usually just singular. By comparison, Salisbury Plain looked like a bona fide battleground. 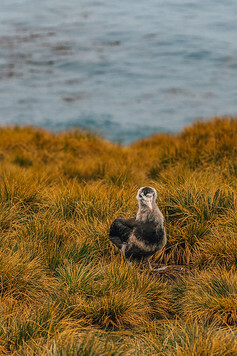 The higher population of skua birds meant that penguins and seal pups – important building blocks of the skua food pyramid – always needed to keep a watchful eye. 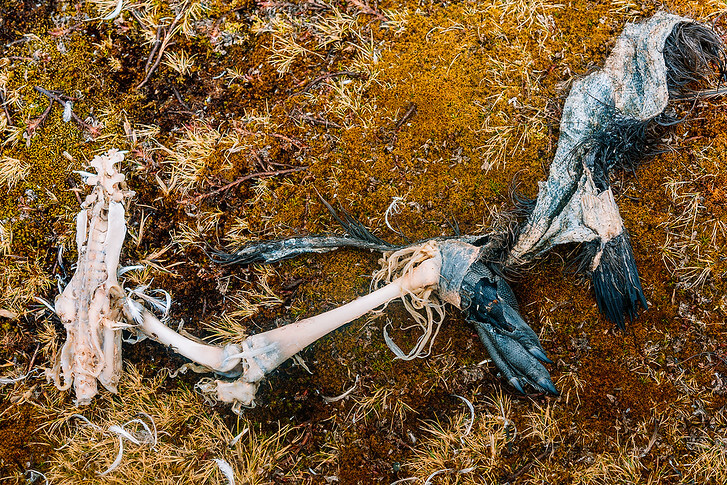 Scattered across the plain were skulls, rib cages, and – in a particularly gruesome sight – an entire penguin skeleton with its feet and trace feathers still attached. Though these sights were trying on the stomach (good thing lunch was far enough in the rearview! ), they were important reminders that, for all the cute penguin waddles and round seal eyes, the Antarctic was still a remote, unforgiving place. Even for those who called it home. Rain was the word during our last day on South Georgia Island. This time, however, it perfectly fit the occasion. Our last South Georgia landing took place in Stromness which, like Grytviken, was an abandoned whaling town that feebly echoed the territory’s once-prominent industry. Because pieces of the dilapidated buildings can be strewn about during harsh conditions, South Georgia mandates that all observers keep at least 200 meters’ distance from the nearest structure. Walking among this fossilized town would’ve been a neat experience, but seeing the abandoned buildings, hangars, and propellers from a distance created an eerie yet visually satisfying tableau. The real treat, however, was still one grueling hike away. With heavy rain, sucking mud, rushing rivers, and knee-deep snow serving as obstacles, C and I marched inland for at least an hour to see the crown jewel of Stromness. Though modest by any measure, this wasn’t just any waterfall. Remember Sir Ernest Shackleton? Yes, the British explorer who, once marooned in Antarctica, took a 23-foot lifeboat north to Elephant Island, 800 miles northeast to South Georgia’s southern coast, and 30 miles across the South Georgia Island mountains to civilization? Well, as it turns out, “civilization” was Stromness! 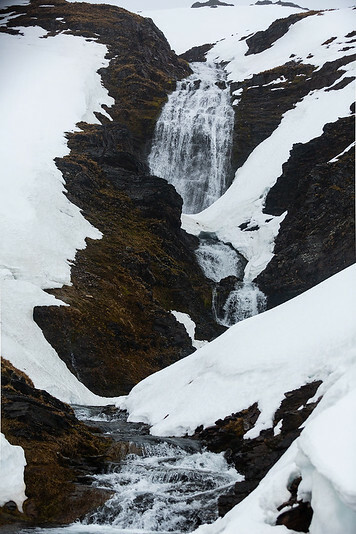 Right around the waterfall, Shackleton, Crean, and Worsley suspected they were close to a whaling town. It was just after dawn, and, if the men were correct, they would hear a piercing work whistle at 7 in the morning. When the whistle blew, the rejoicing men rushed past the waterfall and into Stromness, where the confused whalers soon facilitated one of the greatest ever rescue missions. Even though it was pouring rain and we were soaking wet, it was hard to complain, especially given what Shackleton and his crew endured on the very same land! That’s right, fjords aren’t only in Norway! As the exposed portion of an underwater mountain chain stretching from the Andes to Antarctica, South Georgia is filled with towering, snow-capped mountains. Apparently on days when the sea is calm, you can hear the glacier calving chunks of ice into the water. 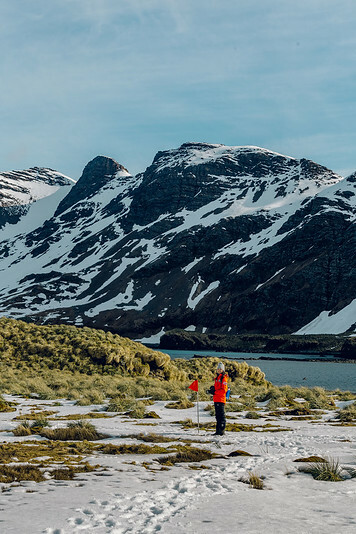 While we were rounding South Georgia’s southern cape en route to Antarctica, our Captain and Expedition Team figured we deserved an intimate look at just how grand these mountains can be. Conditions were a little too windy to attempt a Zodiac cruise, so, instead, we had a lovely vessel cruise through the entire 7-mile fjord. Gathered on the sprawling Deck 5 aft section – a popular and perfect place for taking photographs on board – we were able to snap some great shots upon entering the fjord. As we exited the fjord, we tried our hand with the amazing Joby flexible tripod. Mounting the tripod to the railing of our private sundeck, we filmed an extended video of our vessel exiting Drygalski, which we’ll share once we finish editing it into a neat time-lapse! Cruising the Drygalski Fjord was the perfect coda to our South Georgia Island landings – stunning, serene, and simply breathtaking all around. And that’s it! A recap of our thrilling time in South Georgia. With almost double the amount of breeding birds here than in Antarctica, South Georgia and the South Sandwich Islands are a definite must add to an expedition cruise! Always love reading your blog & learning something about each place that you have been. And the photos are just awesome.As always, thanks for sharing.